Gone are those days when it was only the brides who aspired as well as expected to look their best on D-day of their life. With the changing times, boys have realized that it is not only the brides who are important at the wedding but grooms too share the same place. So, even the modern day groom leaves no stone unturned to look perfect on their wedding day. It is a known fact that the boys now are more conscious about their looks than the girls. Boys want to look equally stunning like girls on the most auspicious and joyous occasion of their life. 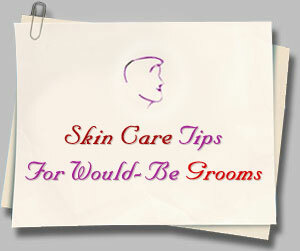 So, if all you would-be grooms are looking for some skin care tips, read ahead to know on how you can make your skin flawless on this special day of your life. The most important thing is get adequate amount of rest. Sleep around 7-8 hours per day. Don't overstress yourself because that shows on your face. Wash your face at least 3-4 times a day with a face wash. Prefer not to wash your face with normal soaps. Obviously good diet makes your skin glow and look healthy.So, have a good diet which comprises of all the essential minerals and vitamins. Consume a lot of green vegetables and fruits. Increase your water consumption. Have 10-12 glasses of water each day because consuming large amount of water makes your skin spotless and soft. Do not consume too much of oily food. Excess of everything is bad so stay away from it as much as you can. Consuming too much of oily food can lead to pimples or some type of dark spots on your face. Do not hesitate to go for facials before your wedding, as it is certain to give a radiant glow and shine to your face. Though manicures and pedicures are part of women's beauty treatment but don't hesitate to have these treatments. Just go for it! These are just basic tips, which if followed can make you look perfect on the most important day of your life. Try them out and you surely won't be disappointed. Performing all these will make all heads turn not only for the bride but for the groom as well. Ya the time is changing so fast grooms too taking care of their look fair. Why should not, this is the way to change. Well, great kudos for tips given by you. Actually I never took care of my skin but I always like to do some activities which helps to keep fair skin. Not three times but two times I used to wash my face using face washer, and I used to bath two times everyday. You suggested required 7-8 hour sleep but I can get only 6 hour.... Because I always used to work till late night. For definitely I would like to recommend to one of my friend to do facial before his wedding. Thanks for great tips.